Apple today launched iTunes Plus, offering DRM-free music tracks with 256 kbps AAC encoding, for audio quality almost as good as the original recordings, for just $1.29 per song. 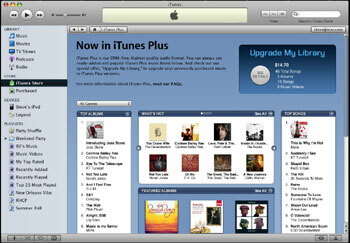 iTunes Plus is launching with EMI’s digital catalog of recordings, including singles and albums from Coldplay, The Rolling Stones, Norah Jones, Frank Sinatra, Joss Stone, Pink Floyd, John Coltrane and more than a dozen of Paul McCartney’s classic albums available on iTunes for the first time. iTunes will continue to offer its entire catalog, currently over five million songs, in the same versions as today 128 kbps AAC encoding with DRM at the same price of 99 cents per song, alongside the higher quality iTunes Plus versions when available. In addition, iTunes customers can now easily upgrade their library of previously purchased EMI content to iTunes Plus tracks for just 30 cents a song and $3.00 for most albums. With the release of iTunes Plus, customers can now download tracks from their favorite EMI artists without limitations on the type of music player or number of computers that purchased songs can be played on. iTunes is also offering customers a simple, one-click option to easily upgrade their library of previously purchased EMI content to the iTunes Plus versions. EMI music videos are now also available in iTunes Plus versions with no change in price. iTunes Plus songs purchased from the iTunes Store will play on all iPods, Mac or Windows computers, widescreen TVs with Apple TV and soon iPhones, as well as many other digital music players.